Soprano Kristine Opolais made a celebrated Met debut in Puccini’s bittersweet story of love and loss. She sings Magda, a young woman who leaves behind her luxurious existence as the mistress of the rich Rambaldo (Dwayne Croft) to follow her heart and live with Ruggero (Giuseppe Filianoti)—but their happiness is short-lived. 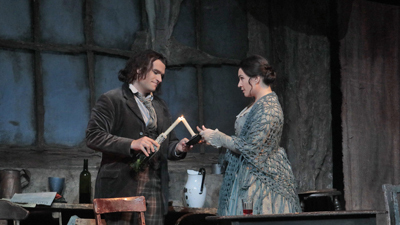 Anna Christy is Magda’s feisty maid Lisette and Marius Brenciu sings the poet Prunier.